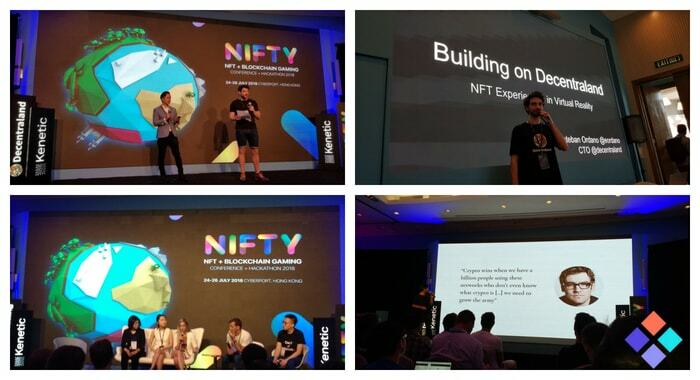 As day one of the NIFTY conference & hackathon draws to a close it is fair to say that Ari, Esteban, Tony & Chris did not fail to deliver. Every talk was full of enthusiastic onlookers ready to digest every bit of information the team had to offer. Ari kicked off the morning with a welcome speech. Next it was Tony Sheng who gave the first presentation of the day with a well informed run through covering the opportunity for NFTs. Later in the day it was Christopher Chapmans turn to host a panel discussing NFT game design with a host of other talented blockchain gaming companies. A particular highlight from the discussion was the impromptu decision by Chris to ask the panelists and the audience to design a game concept right there and then, unscripted, which somehow ended up involving exploding dim sum and dangerous driving. After lunch it was Estebans turn to run through building interactive experiences and games with the Decentraland SDK. The presentation included a game where the aim was to scale a mountain whilst shooting bad guys on the way up with the fastest to the top winning. There was also a sneak peak of the Decentraland Alpha version, although there is likely to be more of a focus around that on day 2. Last but not least, towards the end of the day Ari joined a panel of experts to discuss investing in NFT’s. One of the key takeaways was the general consensus that when researching projects to invest in, it wouldn’t be a bad idea to put your money into projects that have a ‘use and usability’ focus for the tokens or currencies they create. Happy to say that Decentraland ticks both of those boxes. All being said, the Decentraland team did a great job today, leaving everybody wanting more and wondering what is around the corner on day 2 of the event. Decentraland Alpha Demo & How ..